- ★Energy Savings: Built-in motion sensors automatically turns on/off the bulb when no movement is detected for more than 30 seconds. The bulbs operate at1000lm and have 95% energy saving over traditional 100W halogen bulbs. 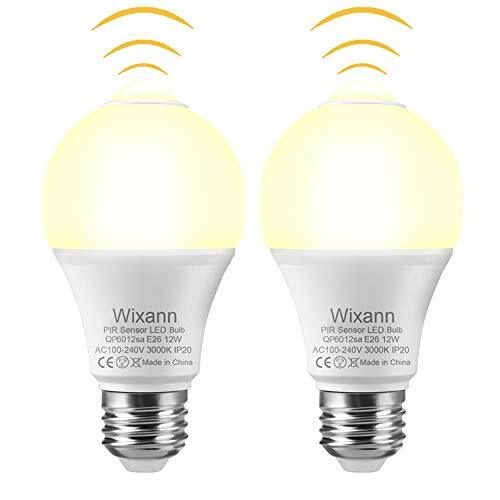 - ★Recommend applications: These bulbs are a perfect addition in a hallway, basement, porch, garage, storage room, or laundry room.Bulbs are compatible with any standard E27 socket and recommended for Indoor use. Keep the bulbs away from moisture and extreme heat. - ★We suggest installing the sensor bulb at least 9 to 10 ft high (about 3 meters) to maximize the sensor's sensitivity. - ★1 Year Warranty: Please contact us for any warranty issues and our professional team will assist via email within 24 hours.